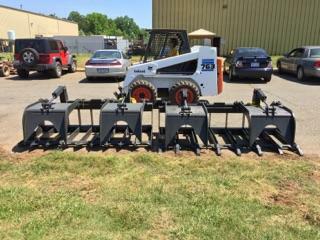 48" forks grapples 48 to 84" tillers rock grapples rock buckets stump buckets and grapples hay spears brooms bush hogs tree pullers/shears dozer blades snow plows seed spreaders snow buckets root rakes Many other items in stock! Trader Tripp's was established in 2011 by tripp myers. The company is based upon cutomer service and product quality. We spcialize in skid steer attachments and used skid steer sales. We are a friendly company that welcomes anyone to come and view our inventory at any time. We keep many items in stock for any and all applications. Also we strive to keep our prices competitive with any other company.